For a few months now I’ve been running a website devoted to fashion and beauty. It’s not really my area of expertise (right now I’m living through a Mongolian winter at -30 Celsius, so fashion is taking a four month long sabbatical in favour of furry deerstalkers and enormous winter coats), but as fashion and beauty are popular subject on this here interweb the site generates a good amount of traffic, which is always nice. Anyway… I’ve always been a bit of a stats junkie, checking through the traffic logs with an almost religious devotion in an effort to spot trends, and a couple of weeks ago I began to see an upswing in an odd subject: that of the necklace worn by Ryan Gosling in the 2011 movie Crazy Stupid Love. All of a sudden hundreds and hundreds of people were flooding to my site seeking out information about the necklace: what’s it made of? Where can I buy it? How much does it cost? Now, as I said I’m living in Mongolia, which is a little off the beaten celebrity track. The last movie I saw was a 1997 Czech film about a poverty stricken cellist and his young son, so I’m not all that familiar with this Ryan Gosling character, and until a few weeks ago I’d not so much as heard about Crazy Stupid Love. Still, as I am at heart a dirty capitalist I reasoned that it might be worthwhile to watch the movie and find out a little about Gosling – primarily, where did he get his necklace, and how can I use that information to make a little money come my way? So, I got online and downloa… I mean, legally purchased Crazy Stupid Love from a licensed and perfectly legal vendor, and I gave it a look. 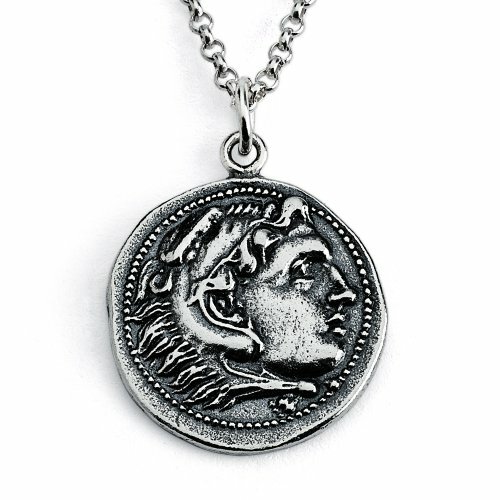 Gosling’s necklace, it seems is some sort of Roman coin pendant that hangs on a long chain, the pendant hanging around the base of the breastbone. It’s not to my taste, I’m afraid (I’m not much for men’s jewelry), but I can understand the appeal. Understandably this is a little disappointing for fans of Gosling who were hoping to pick up their own copy of the necklace. Unless they want to sit down and weld a couple of ancient coins together they ain’t gettin’ it. The necklace is an extremely close match to the one Gosling wore on screen, and we think it looks pretty cool. 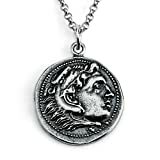 Now, match the Roman coin pendant with a long sterling silver chain. 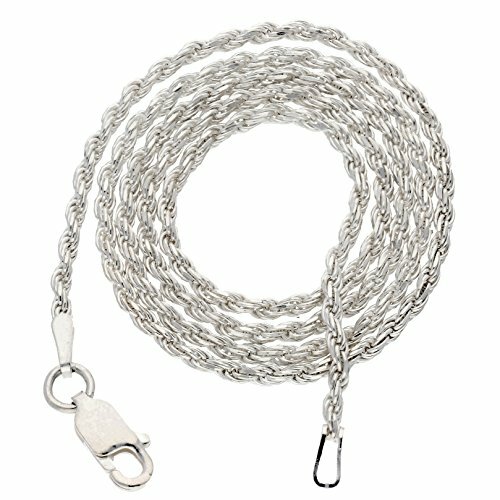 Depending on the thickness you want (and the amount you’re willing to spend) we suggest either a 1.3mm or 2mm chain – take a look at the links to the right for examples. 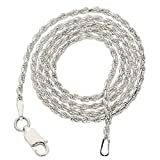 Ryan Gosling’s necklace hangs down to the center of his chest, so we suggest you go for a 24″ silver chain rather than the more typical 18″ length (which would leave the pendant hanging too high on the chest). All told you can get a pretty damned good looking example of Ryan Gosling’s Crazy Stupid Love necklace for less than $100. Not a bad gift for the man in your life. I really love the fine work that’s gone into this necklace, and at $26.75 you really can’t argue with the price. Anyway, it’s time for me to go out and brave the Mongolian chill. There’s no room for talk of necklaces out here on the steppe. Cheerio! First of all I love Ryan Gosling, he is just gorgeous and second of all I had never really noticed his necklace until you mentioned it. It’s amazing and you are so right the price is awesome. I would love to see my boyfriend with this around his neck. Thanks for this~ I was actually looking for this pendant and necklace so I could have my boyfriend wear it :P but you did all the search for me right here. It’s too bad there isn’t an exact replica, but what you’ve found is almost exactly the same thing anyways. It’s beautiful. Now, can you find me a way to get Ryan Gosling? I know it’s all a matter of personal taste, but all in all I’d definitely go with the $39 option you posted rather than waste some ancient artifacts. Is there anywhere in England that i can get this?